Employees sample chocolate made with Kokoa Kamili beans at a staff tasting. 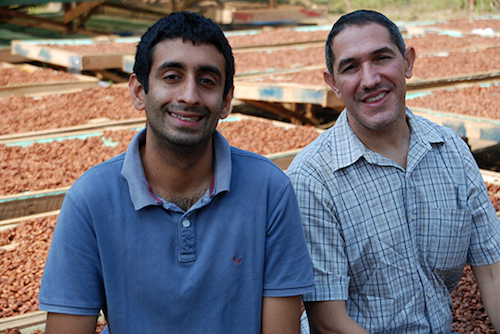 Chocolate lovers may not yet recognize Tanzania as a significant cocoa producer, but Simran Bindra and Brian LoBue saw a unique opportunity in the market. In 2012, Simran left his job with the Clinton Foundation to join the TechnoServe Volunteer Consultant Program (now the TechnoServe Fellows Program) in Tanzania. For five months, he conducted research on the history of cocoa in the country and worked with the Ministry of Agriculture to develop a national cocoa strategy. We’re also strengthening our relationship with the farmers, showing that we care about their livelihoods. When his assignment ended, Simran decided to stay in Tanzania and explore a new venture. Specialty chocolate companies were looking for exciting countries of origin, but Tanzania’s uniquely flavored cocoa had been largely overlooked. Smallholder cocoa farmers in Tanzania typically process cocoa on their own farms after harvest – achieving mixed results on quality – then sell it to agents who in turn sell to commodity exporters. In this model, farmers earn a low price for their cocoa, giving them little incentive to improve the quality of their beans, and little opportunity to improve their livelihoods. “I perceived a gap in the market – producing high quality beans for the premium cocoa market,” said Simran. He discussed his idea with Brian LoBue, a former management consultant who had just finished a stint as a Program Manager with TechnoServe and was living in Tanzania. Brian, who had previously explored business opportunities in the coffee sector, thought Simran’s idea was fascinating and delved deeper into the numbers. Kokoa Kamili founders Simran Bindra and Brian LoBue. They drew up a business plan that focused on the specialty market and prioritized paying farmers a premium price for their cocoa. Kokoa Kamili, which means “perfect cocoa” in Swahili, was born. Based in the Kilombero Valley in southwestern Tanzania, Kokoa Kamili buys wet, or unprocessed, cocoa from more than 2,500 farmers, and ferments and dries the beans at the company’s own facility. By centralizing the processing, Simran and Brian can ensure consistently high quality, monitoring the temperature, acidity and moisture levels throughout fermentation. They are also saving farmers the time and labor they would have spent on processing the cocoa themselves, while paying them 24 percent above the market rate. 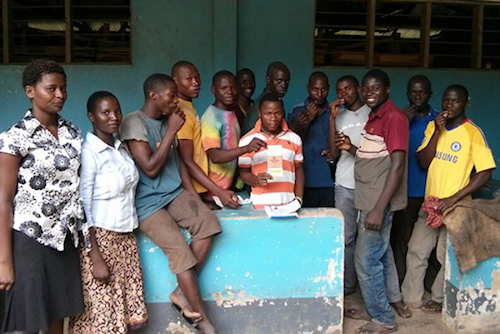 Some of the farmers who sell cocoa to Kokoa Kamili are working with TechnoServe to improve their agricultural practices through the Cocoa Quality and Market Access program, an initiative funded by Irish Aid to increase the incomes of 10,000 cocoa farmers in Tanzania. Kokoa Kamili also collaborates with TechnoServe on developing training materials and delivers extension services directly to farmers in the Kilombero region. 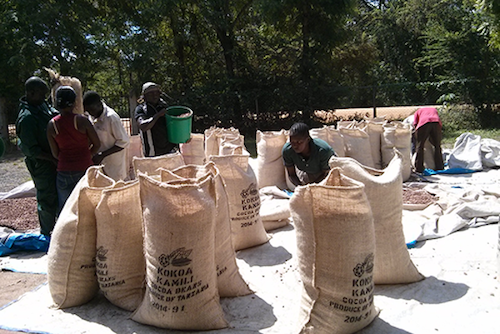 After the beans are fermented for several days and sun-dried, they are ready for export. The strategy is paying off. Kokoa Kamili is selling cocoa directly to chocolate makers and specialty brokers in North America, Europe and the United Arab Emirates. In 2015, the company’s third year of operation, Kokoa Kamili sold 82 tons of cocoa, increasing its production by 70 percent over the previous year. Kokoa Kamili beans were shortlisted for a Cocoa of Excellence award in October, decidedly putting Tanzania on the cocoa map.